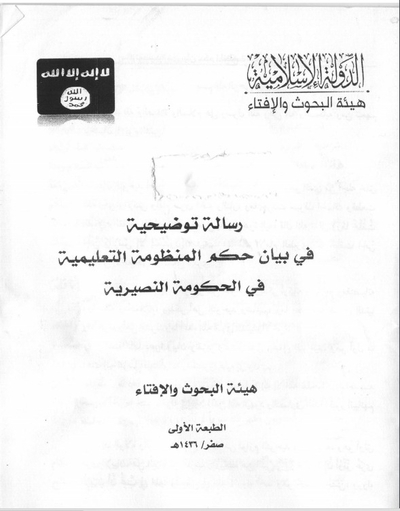 This small treatise, written by the al-Buhuth and al-'Eftaa Committee (Research and Fatwa Issuing Committee) that forms one of the key government departments of the Islamic State [IS], is an important historical text in the reform of the education system under IS rule. Having seized large swathes of contiguous territory spanning the borders of Iraq and Syria and officially declared itself to be the Caliphate, IS set up a Diwan al-Ta'aleem (Education Ministry) under the leadership of Dhu al-Qarnain (a German national of Egyptian origin). The ministry designated the 2014-2015 academic year as one of transition for schools, as the curriculum would have to be reformed to accord with IS ideology, including the outlawing of subjects deemed forbidden and the writing and publication of a comprehensive set of new textbooks. A significant problem for IS is that it cannot simply produce from within its own ranks a whole new cadre of educational staff and teachers for its populations. Therefore it has to rely largely on pre-existing structures and personnel so that the education system can function on the ground. 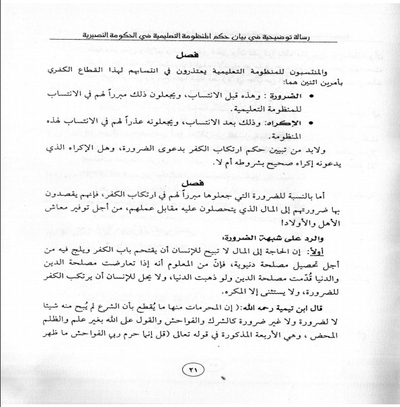 In order to secure the compliance of these elements with its regulations, the Diwan al-Ta'aleem took the decision around late December 2014 (see here: Specimen Z) to order the closure of schools and suspension of teaching so that repentance programs and Shari'i sessions could be organized for teachers and academic staff. This has included the requirement to study textbooks on Islamic doctrine according to IS specifically produced for these processes for education personnel (e.g. see Specimen 5K). 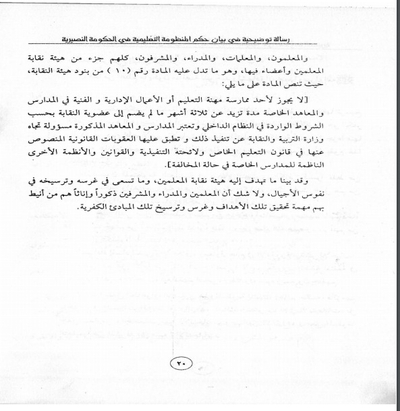 Much of the documentary evidence for these transitional steps has come from Syria (e.g. Specimens 3B, 3D, 4U and 5N) and it is clear that there was no uniform undertaking of repentance and 're-education' at one time but rather the timing varied from place to place. In theory, all schools should have been ready for the new school year beginning in September 2015, but that was delayed by more than a month. Many schools still remain closed throughout IS territory as parents refuse to send their children or educational personnel refused to undergo the required processes, barring them from teaching.
. Tawheed [monotheism] is the main fundamental principle of Islam, requiring love for what is Islamic and hatred of what is non-Islamic.
. The education system is key for any state to implant the values it espouses in its population, and there is no doubt the disbelievers use the education system to propagate their values.
. To understand the ruling on the Syrian education system, one must clarify first the ruling on the Syrian regime.
. Based on the characteristics of the regime, there is no doubt it represents kufr [disbelief], so the education system, which is designed by the regime to embody its values, is also a system of kufr. 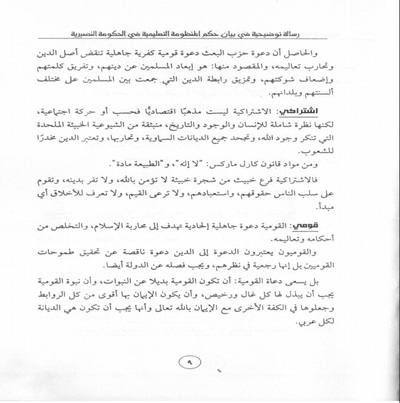 This is reinforced by the declaration of the objectives of the teachers syndicate commission.
. Since all educational personnel are affiliated with the syndicate commission, they are part of a system of kufr. They cannot be excused on grounds of necessity or compulsion. Therefore they are guilty of apostasy by virtue of their affiliation.
. The fact that they have fallen into apostasy requires for them to repent. In the meantime schools should be closed for this process to be carried out. The text features many unsurprising citations (e.g. 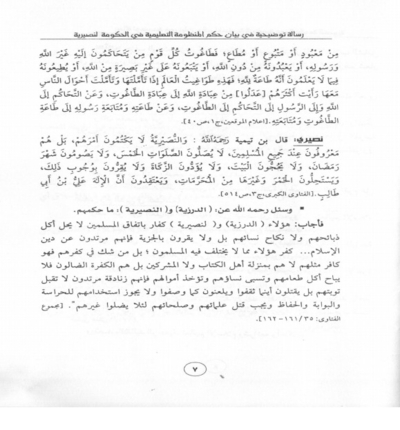 Ibn Taymiyya & Muhammad ibn Abd al-Wahhab) in its exposition of arguments. It is also useful for understanding the IS rejection of concepts like Ba'athism, nationalism, human rights and democracy. The text is translated in full below with the original Arabic (H/T: the Democratic Republic Studies Centre, which produced a study on education in Raqqa under IS). Context notes are provided within square brackets throughout the text. Parts in bold and/or underlined come from the text's own emphasis. Message of clarification on the statement of the ruling on the education system in the Nusayri government. 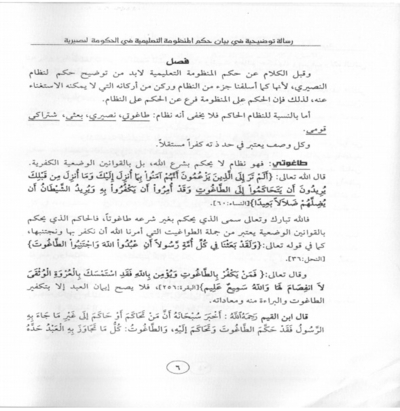 Indeed Tawheed is ['the principle of the religion of Islam, its foundation and its base'- this bit of text missing from the copy of the text], and it is the reason for which God created Jinn and men, and established the market of Paradise and Hellfire. And the swords of jihad have not been bared, and the steppes and plains have not been cut through, except to realize it, implement it and call to it. God Almighty has said: "And I did not create Jinn and men except that they should worship"- (al-Dhariyat 56) [Qur'an 51:56]. Imam al-Tabari said: "I did not create Jinn and men except to worship Me, and bow to My command." And the Qur'an from start to finish makes Tawheed the principle, and mentions its pillars and necessities, its requirements, obligations and fulfilments. It also mentions the people of Tawheed and their affairs, and what God has prepared for them in this world and the Hereafter, as well as the people of shirk [idolatry] and what God has prepared for them in this world and the Hereafter. And the entire Sunna is a spoken and practical call, statement, reporting and interpretation of Tawheed, and it is the first thing that the Messengers called to, so they began by it and continued upon it until they died. For the first thing that the Messenger of God (SAWS) called for: "Say there is no deity but God: you will prosper" (narrated by Ahmad on sound transmission). And the last thing SAWS concluded in his words: "God curse the Jews and Christians who have taken the graves of their Prophets as places of worship"- (muttafiq alayhi). And indeed al-wala' and al-bara' [loyalty to Islam and disavowal of non-Islam] and love and hostility are among the necessities of Tawheed and its requirements: and it is the surest bond of faith. On the authority of al-Bara' bin Azeb (may God be pleased with him) on the authority of the Prophet (SAWS): he said: "Indeed the surest bond of faith is that you love in God and hate in God"- (narrated by Ahmad [ibn Hanbal] and it is a sound hadith, while al-Tabarani [early hadith scholar] and al-Baghawi [Persian Shafi'i jurist] narrated on sound transmission with the expression: "The surest bond of faith is loyalty in God and hostility in God, love in God and hatred in God"). For Tawheed of man cannot be straight or just except by love in God and hatred in God, and affection for God is one of the conditions of there is no deity but God, and among the necessities and requirements of affection for God is affection for His supporters and loyalty to them, while disavowing His enemies and being hostile to them, as it is the path of our father Ibrahim (peace be upon him) and the path of all the Prophets and those sent. God Almighty has said: "Indeed there has been a good example for you in Ibrahim and those who were with him when they said to their people: 'We disavow you and what you worship besides God. We have denied you and there has now arisen enmity along with hatred between us and you forever until you believe in God alone.' Indeed Ibrahim said to his father: 'May I seek forgiveness for you but I do not have anything for you against God, our Lord. Upon You have we relied, and to You have we returned, and to You is the destination" (al-Mumtahana 4) [Qur'an 60:4]. And the Messenger of God (SAWS) said: "Lo, the family of my father- i.e. so-and-so- are not friends to me, but rather the friends of God and the just of the believers" (narrated by Muslim). And indeed among the foundations and principles of the Ahl al-Sunna wa al-Jama'at: taking people by outward appearance and ruling upon them in what has appeared outwardly from their deeds without looking into their inner thoughts. 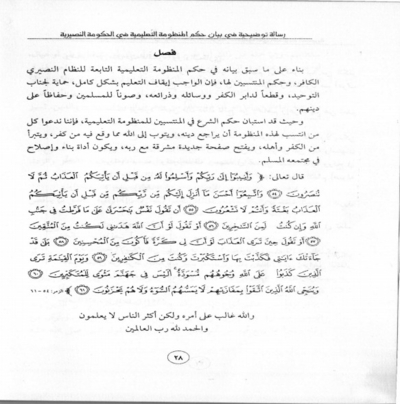 It was narrated by al-Bukhari in his authentic collection on the authority of Omar bin al-Khattab (may God be pleased with him): that he said: "Indeed people would be taken by inner thought in the pledge of the Messenger of God (SAWS), but indeed inner thought has been cut off, and so we take you now by what has appeared for us from your deeds. So whoever has shown what is good, we have guaranteed his life for him and become close to him. And we have nothing to do with his inner thought. God will hold to account his inner thought. And whoever shows evil to us, we do not guarantee his life for him and we do not trust him, even if he says that his inner thought is good." And among the most important issues of religion: getting to know the names and rulings, and what follows upon them from religious and doctrinal rulings, for our religion has divided the people into believer and disbeliever, monotheist and idolater, just and immoral. And every name has its ruling, and dealing with it differs from one person to another, and our law has placed people in their positions. So the believer has a ruling and is to be dealt with as is appropriate for him, and for an immoral person there is what is appropriate for him in dealing with him, and the disbeliever has a dealing that he deserves according to the law. And the ruling on the people in any of these rulings has its reference point in the Book [Qur'an] and the Sunna. 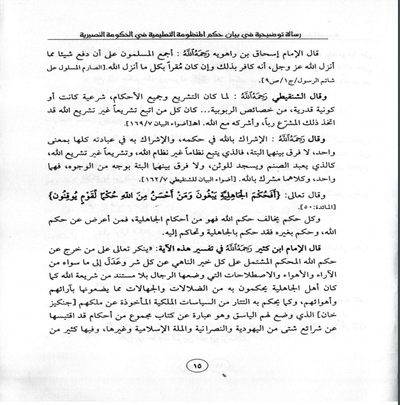 Ibn Taymiyya (may God have mercy on him) said: "Know that the issues of takfir and tafsiq are among the issues of names and rulings on which the promise and the threat in the abode of the Hereafter depend, and on which loyalty, hostility, killing, innocence and other matters depend in this world" (Fatwas 12/468). So every person is to display his condition on the basis of the law and is to be judged by its requirement, and after the ruling of the law on him he is to be dealt with as appropriate from affection or hostility or al-wala' or al-bara'. And indeed the state of the Islamic Caliphate is a state that has arisen on the basis of God's law, and its source in every matter is the Book and the Sunna, and God has blessed it so it has conquered the land, and its people are in all kinds of circumstances. And it [the Islamic State] is wholly eager to apply the law of God, have recourse to it, and issue from it in every movement and repose. And indeed dealing with the people branches out from knowing the ruling of God upon them until every person is placed in his position and obtains the appropriate treatment. And indeed among the important causes that must be known about and on which God's ruling must be brought is the cause of education because it is considered the sector expressing the religion and program of states and organizations, so the ruling on the educational apparatus must be known, and the ruling on those affiliated with it. And it is not hidden from anyone of how important a part education plays in every state, for the education system is considered among the most important pillars of the states, and it is part of the regime and a foundational pillar, a crucial joint, a strong-arm in it, and a face for it on the inside and outside. Therefore every government gives the educational system great importance for a role it plays in ingraining ideas and beliefs as well as implanting ethics and customs. For it is the gate through which organizations enter to spread their principles, establish the pillars of their rule and secure the loyalty of the people and their support for them. The disbelievers and apostates have exploited the educational system for through it they have encouraged disbelief, heresy and doctrinal and moral decadence. And they have distanced the Muslims from the pure spring of religion, they have distorted their ideas and doctrines, and have corrupted them through the education programs that they have placed to serve their goals, and conscript the peoples to protect them. 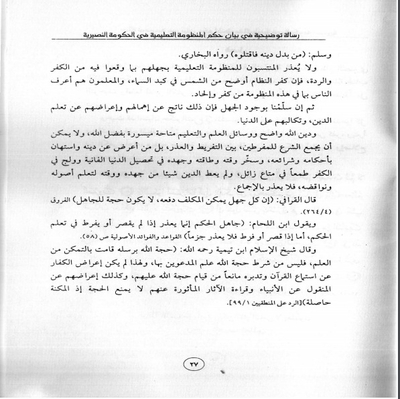 And the education system is of no less importance than the military sector, but actually is greater in influence than the military sector, for the military sector has been put in place to subjugate the people to the Taghut by iron and fire, while the education system has been put in place to do away with the signs of the religion, make people support the Taghut, and ingrain its ideas and principles through persuasion and instruction. And this is of stronger and greater harm than the military sector, rather even the military sector when it is subjected to the Taghut and dies in defence of it after the implanting of its principles and ideas in them through the education organization. Muhammad Qutb [brother of Sayyid Qutb] (may God have mercy on him) said: "And there is no doubt in our view that the study programs in our schools and institutes are of the blatant tinge of Jahiliya, put in place for us by our enemies in order to turn us away from our Islam, and using the education programs as an undertaking is among the greatest of its tools and the most dangerous of them, and if there were not in these programs things besides their constant dissemination of patriotic, nationalist, secularist and socialist causes...and their lasting commendation of those who do not rule by what God has brought down...it would have sufficed as a sin, but in truth they do not stick to that in any of the stages but indeed they establish a culture and knowledge base opposed to religion, aiming in the end to bring men out of worship of God." And before discussing the ruling on the education system one must clarify the ruling on the Nusayri regime, because as we have made clear before it is part of the regime and one of its pillars that cannot be divorced from it. Therefore the ruling on the system is a part of the ruling on the regime. As for the ruling regime, it is no secret that it is a taghuti, Nusayri, Ba'athist, socialist and nationalist regime. And every characteristic is to be considered as disbelief in its own right. Taghuti: for it is a regime that does not rule by God's law, but by temporary man-made laws of disbelief. God Almighty has said: "Have you not seen those who claim that they have believed in what has been revealed to you and what was revealed before you? 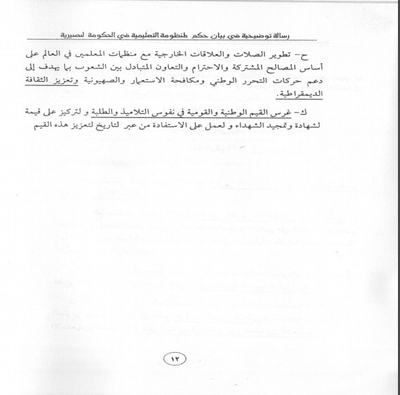 They want to refer rule and arbitration to Taghut even as they were commanded to reject it. And Satan wants to lead them far astray"- (al-Nisa' 60) [Qur'an 4:60]. So God- Blessed and Exalted is He- called the one who does not rule by His law taghuti, so the ruler who rules by temporary man-made laws is to be considered among the tawagheet that God ordered us to reject and avoid, just as in the Almighty's words: "And We have sent to every community messengers saying: 'Worship God and avoid the Taghut'"- al-Nahl 36 [Qur'an 16:36]. And the Almighty has said: "So the one who rejects the Taghut and believes in God, has clung to the indissoluble bond that has no fissure. And God is hearing, knowing" (al-Baqara 256) [Qur'an 2:256]. So man's faith is not authenticated except by rejecting the Taghut, disavowing him and being hostile to him. Ibn al-Qayyim (may God have mercy on him) said: "The Exalted has conveyed that the one who refers legislation or judges not by what the Messenger has brought has made the Taghut ruler and referred legislation to him. And the Taghut is: all that by which man exceeds his limit in what is worshipped, followed or obeyed. So the Taghut of every people is the one besides God and His Messenger to whom they refer legislation, or worship besides God, or follow on the basis of insight besides that from God, or obey him in what they do know that it is obedience to God. 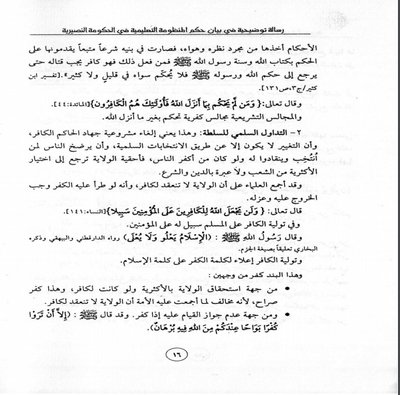 These are the tawagheet of the world: when you have considered them and considered the circumstances of people with them, you have seen that most of them have turned from worship of God to worship of the Taghut, and away from referring legislation to God and His Messenger towards referring legislation to the Taghut, and away from obeying Him and following His Messenger towards obeying the Taghut and following him ('Ilam al-Muwaqqa'in- Part 1, p. 40). Nusayri: Ibn Taymiyya (may God have mercy on him) said: "The Nusayris do not keep their affairs quiet, but rather they are well known among all Muslims: they do not pray the five prayers, they do not fast in the month of Ramadan, they do not perform the Hajj to the House, they do not perform zakat besides not establishing the obligation of that, and they permit wine and other things besides them from forbidden substances, and they believe that God is Ali ibn Abi Talib" (Greatest Fatwas, Part 3, p. 514). And he- may God have mercy on him- was asked about the Druze and Nusayris: what is the ruling on them? 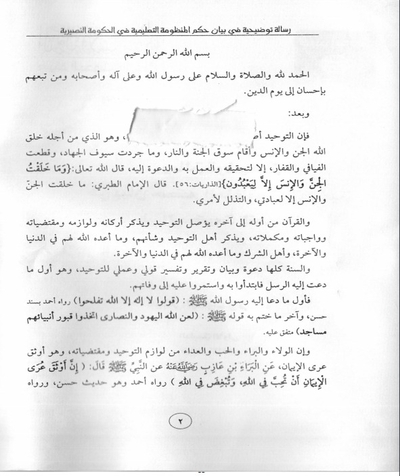 So he responded: these people (Druze and Nusayris) are disbelievers by the agreement of the Muslims: one may not eat their slaughtered animals or marry their women: in addition, they are not to be established by jizya because they are apostates from the religion of Islam...the disbelief of these people is something the Muslims do not disagree on, but also whoever doubts their disbelief is a disbeliever like them as they are not in the category of People of the Book or idolaters [mushrikeen], but rather they are disbelievers in error: so it is not allowed to eat their food: their women are to be taken captive and their wealth is to be taken. For they are apostate heretics whose repentance cannot be accepted: rather they are to be killed wherever they are caught, and they are to be cursed as they have been described: and it is not allowed to use them for bodyguards and protection of gates and guards. It is also necessary to kill their 'ulama and religious men so that they may not lead others besides them astray (Collection of Fatwas 35/161-162). Ba'athist: the Ba'ath party is a nationalist party, secularist and not religious, calling for complete overhaul in Arab understandings and values, to forge them and turn them towards socialist direction, and they have a declared slogan [Syrian Ba'ath Party founding slogan], which is: "One Arab Ummah with an Eternal Mission"- and it is the mission of the party. And the founder of this party is Michel Aflaq the Christian, who established the Arab Socialist Ba'ath Party in April (Nisan) of 1947. 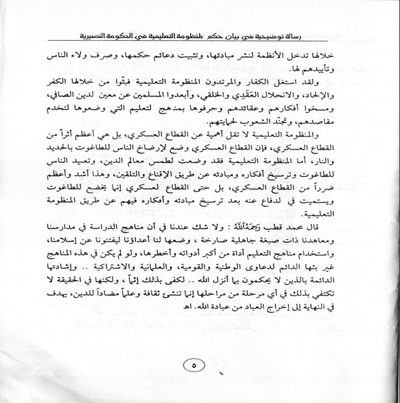 And his intention from the founding of this party was to revive nationalist Jahiliya, and condemn Islam and push back its teachings, and overturn understandings of Islamic brotherhood and forge them in Arab nationalist terms, while Arab nationalism becomes the principle of al-wala' and al-bara', and under it the banishment of the religious distinctions. - Article 5: "Ban on establishing political parties and associations that arise on the foundation of pushing for religion in politics." And this is the source of irreligious secularism that aims for being freed from the teachings and rulings of Islam, and removing religion from dealings, and confining it to the mosques only. 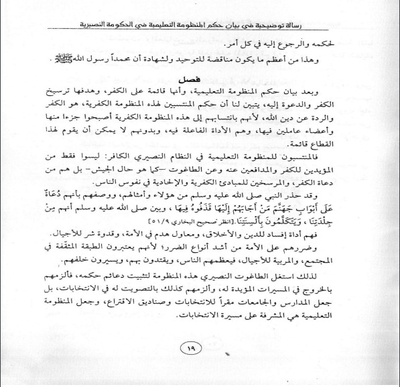 - Similarly it has come in Article 15 among the principles of the party: "The nationalist bond is the sole bond that should arise in the Arab states that are responsible for harmony between citizens..."
And this is clear in annulling Islamic brotherhood and making nationalist as the basis of brotherhood, affection and hostility. And in article 41: "The party's politics are geared towards creating a new Arab generation adopting scientific thought, with release from the bonds of superstitions and backward traditions" (see: the Struggle of the Ba'ath Party by Michel Aflaq: 1/170). And by backward traditions he means the teachings, laws and rulings of Islam. The point is that the call of the Ba'ath Party is a nationalist, disbelieving call of Jahiliya nullifying the principle of religion and making war on its teachings. And the intention from this: distancing Muslims from their religion, and separating their word and weakening their might, and tearing up the bond of religion that has brought the Muslims together over their varying languages and lands. Socialist: socialism is not only an economic school of thought or social movement, but also a comprehensive theory of man, existence and history, emanating from evil heretical Communism that condemns God's existence, rejecting all heavenly religions and waging war on them, while considering religion an opiate for the masses. And among the laws of Karl Marx: "There is no God" and "Nature is material." So socialism is an evil branch of an evil tree not believing in God, and it is does not establish his religion, and it arises on depriving people of their rights and oppressing them. It also does not cultivate values, and accords no principle to morals. Nationalist: nationalist is a call of heretical ignorance aiming to wage war on Islam, and get rid of its rulings and teachings. Nationalists consider the call to religion a call deficient in the realization of the nationalists' ambitions, but also they consider it backward, and that it must be separated from the state as well. If you like, the advocates of nationalism are aiming for nationalism to be a replacement for the prophesies, and the prophets of nationalism stipulate that all that is precious and cheap must be spent for it, and that faith in it must be stronger than all the bonds. And they have placed it in the other palm with faith in God Almighty and stipulated that it must be the creed for every Arab. Get me up on an Eid making the Arabs an Ummah...and lead my body on the religion of their land. Peace be upon disbelief uniting us...and hello and welcome after it to hell." [words by the Lebanese Christian Arab nationalist poet Rashid Salim al-Khoury]. Some of the Arab nationalist thinkers say: "If every age has its holy prophets, then Arab nationalism is the prophet of this age!" And one of them said: "Oh Muslims, oh Christians, your religion- the religion of Arabism- is one, not two." And among their slogans: "I have believed in the Ba'ath as lord, with no partner for it...and Arabism as a religion that has no second." The foundational law for the teachers' syndicate issued by legislative clause no. 82 the year 1970. - Struggle for the sake of realizing the united socialist Arab society under the leadership of the Arab Socialist Ba'ath Party. 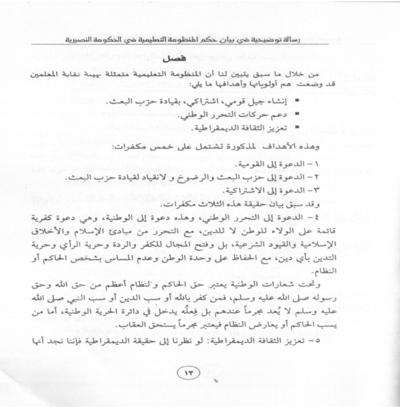 - Raising the level of vocational consciousness and the nationalist socialist consciousness among the teachers and sharing in the preparation of the Arab teacher in the teachers' institutions and colleges on their varying levels in the preparation of ideology, struggle and professional vocation in so far as it is possible for one to bear one's responsibilities with high capability- in addition to tracking the cultivation of teachers during service. - Participating in raising the level of the Arab school in its various levels and types, while developing its programs and paths as the aims of nationalist socialist education are realized. - Developing external links and relations with progressive organizations for teachers in the world in what aims in the world to support national liberation movements, the struggle against imperialism, colonialism and Zionism, and foster a democratic education and implant affection between the peoples. - Developing external links and relations with teachers' organizations in the world on the basis of shared interests, respect and mutual cooperation between people in what aims to support national liberation movements, the struggle against colonialism and Zionism, as well as reinforcing democratic culture. - Implanting patriotic and nationalist values in the lives of pupils and students, and concentrating on the value of martyrdom and glorifying the martyrs, while aiming to benefit from the use of history to reinforce these values.
. Nurturing a nationalist and socialist generation under the Ba'ath Party's leadership.
. Supporting national liberation movements. 2. 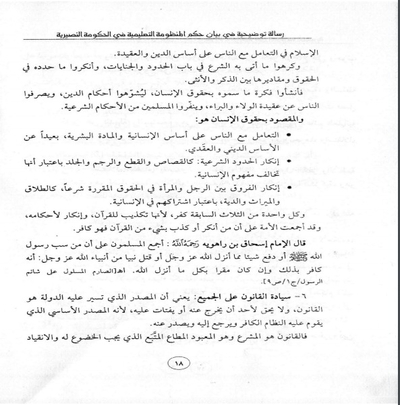 Call to the Ba'ath Party and subjection and subordination to the Ba'ath Party leadership. And the truth of these three things has been made clear as causes of disbelief. 4. Call to national liberation, and this is a call to patriotism, and it is a call of disbelief established on the basis of loyalty to the homeland and not the religion- even as liberation is among the principles of Islam and Islamic morals and Shari'i bonds- opening the field to disbelief, apostasy, freedom of opinion and freedom to profess any religion, with preservation of the unity of the homeland and not infringing on the person of the ruler or regime. And under the slogans of patriotism the right of the ruler and regime is considered greater than the right of God and right of His Messenger (SAWS), so whoever disbelieves in God or blasphemes the religion or blasphemes the Prophet (SAWS) is not considered a criminal among them but rather his deeds come under the patriotic framework of freedom. As for the one who blasphemes the ruler or opposes the regime, he is considered a criminal deserving punishment. 5. Reinforcing the democratic culture. If we look at the truth of democracy we find that it includes six tenets of disbelief, which we will derive them from the truth of the meaning of democracy. Democracy is: rule of the people, peaceful handover of power, separation of powers, independence of the judiciary, respecting human rights and the rule of law over all. 1. Rule of the people: the meaning being that legislation and law-making are referred to the people, not to God Almighty, so the people rules itself in what it chooses, and that by whoso represents them in the legislative councils of disbelief. And the legislative councils are councils of disbelief and Taghut opposed to God in His rule, and conflicting with Him in His lordliness, divinity, names and qualities. The Almighty has said: "Indeed: to God belongs creation and command. Blessed is God, the Lord of the Worlds"- (al-A'raf 54) [Qur'an 7:54]. And the Almighty has said: "And your Lord creates what He wills and chooses. The choice has not been for them. Exalted and Almighty is God over what they associate with Him"- (al-Qasas 68) [Qur'an 28:68]. And the Almighty has said: "Or do they have partners who have legislated for them what God did not permit? Were it not for the decisive word, it would have concluded between them. And indeed the wrongdoers will have a painful punishment" (al-Shura 21) [Qur'an 42:21]. And SAWS has said: "Indeed God is the ruling and to Him belongs the ruling"- brought out by Abu Dawud and it is authentic. So God- Exalted is He- is the creator of everything and is the One who orders and legislates. And He is the ruling that rules and arbitrates between His servants, and no one has the right to legialte wth God or decide on what contravenes God's ruling, so whoever does that has rejected and pushed aside God's ruling, and has made himself a peer of God, and a taghut to be worshipped besides God. Therefore the Almighty has said at the end of the verse: "Exalted and Almighty is God over what they associate with Him." Imam Ishaq bin Rahwayh [early Persian Islamic scholar] (may God have mercy on him) said: "The Muslims have agreed that rejecting anything brought down by God- Almighty and Exalted is He- constitutes disbelieving in that, even if one is firm in all that God has brought"- (al-Sarim al-Maslul ala Shatim al-Rasul: part 1, p. 9) [the quotation is from a work by Ibn Taymiyya]. 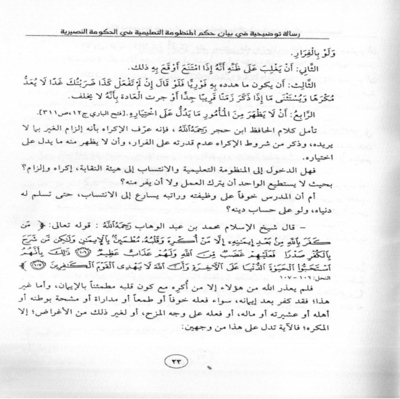 Al-Shinqiti [modern era Salafi scholar] (may God have mercy on him) has said: "Since legislation and all the rulings, whether Shari'i or of divine will, have arisen from the attributes of Rabubiya ...all who have followed legislation besides that of God's legislation have taken that legislator as lord, and associated him with God"- (Adwa' al-Bayan 7/169). And he- may God have mercy on him- said: "Associating a partner with God in His ruling, and associating a partner with Him in worship of Him, all of this has the same meaning, and there is no distinction between the two of them in the final decision, so the one who follows a regime not that of God, and a legislation not that of God, is as the one who worships idols and prostrates to idols, and there is no distinction between them in the final decision in any respect, so the two are one, and both of them associating partners with God"- (Adwa' al-Bayan by Shinqiti: 8/162). And the Almighty has said: "So is it the rule of Jahiliya they desire? And who is better than God in ruling for a people understanding?" (al-Ma'ida 50) [Qur'an 5:50]. And every ruling contravening the ruling of God is of the rulings of Jahiliya, so whoever turns from the ruling of God and rules besides His has ruled by Jahiliya and referred to it as law. 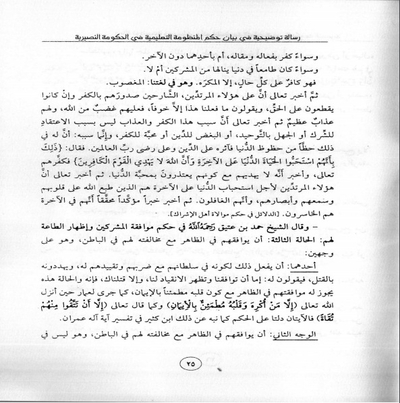 The Imam Ibn Kathir (may God have mercy on him) said in the tafsir of this verse: "The Almighty condemns the one who has left the rule of God, which arbitrates and encompassed all good and forbids all evil, and has turned to what is besides it from opinions, whims and technicalities that men have put in place without derivation from the Shari'a of God as the people of Jahiliya used to rule from errors and ignorance that they would apply through their opinions and whims, and just as the Mongols rule by it from kingly politics derived from their kings [Genghis Khan] that he placed for them as Yassa- and it is a term for a book collected from rulings that he derived from laws mainly from the Jews, Christians, Islamic path and others besides them. And in it also are many rulings that he simply derived from his opinion and whim. And it became among his descendants law to be followed, which they submit over the rule by the Book of God and the Sunna of the Messenger of God (SAWS) so whoever does that is a disbeliever who must be fought until he returns to the rule of God and His Messenger (SAWS), so there is no arbitrator besides that in few or many" (Tafsir Ibn Kathir part 3 p. 131). And the Almighty has said: "And whoever does not rule by what God has revealed: such persons are the disbelievers" (al-Ma'ida 44) [Qur'an 5:44]. And the legislative councils are councils of disbelief ruling by besides what God has revealed. 2. 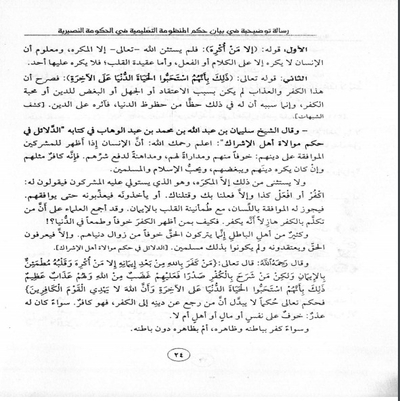 Peaceful handover of power: this means annulling the legitimacy of jihad against the disbelieving ruler, and that change will only be through peaceful elections, and that the people are to be subjected to whosoever has been elected and are to be led by him, even if he is among the most disbelieving of people, for the priority of power is referred to the choice of the majority of the people with no consideration to religion or law. And the 'ulama have agreed that power is not be convened for a disbeliever, and that should disbelief come upon him it would be necessary to come out against him and depose him. The Almighty has said: "And God will never place a path for the disbelievers over the believers"- (al-Nisa' 141) [Qur'an 4:141]. And in the gaining of power for the disbeliever over the Muslim is a path for him over the believers. And the Messenger of God (SAWS) said: "Islam is supreme and has nothing over it" (narrated by al-Daraqtini and al-Bahiqi and al-Bukhari mentioned it in commenting on the form of decision).
. In the respect of the deserving of power by the majority even if it is for a disbeliever, and this is clear disbelief, because it is in contravention of what the Ummah has agreed on that power is not convened for a disbeliever.
. And in the respect of not allowing for an uprising against him if he is a disbeliever, but SAWS has said: "Unless you see clear disbelief in your view in which there is proof from God." And the Imam Ibn al-Arabi [medieval Maliki jurist], and al-Hafiz Ibn Hajer have transmitted the consensus on the obligation of rising up and coming out against the ruler when disbelief comes upon him. 3. Separation of powers: and among the powers is legislative power, executive power, judicial power and the like. And the principle of meaning from the separation of powers is the separation of religion from the state and politics, and it is the call upon which the support bases of irreligious secularism have arisen, and the meaning from them is the preservation of religion in the mosques and places of worship and the like, and the independence of internal and external politics from the regulations and instructions of the law. 4. Independence of the judiciary: by which they mean the judiciary existing in the states of disbelief and apostate organizations, and it is a judiciary whose source is the temporary man-made laws and idolatrous legislative councils, and it is among the strongest of the sectors in disbelief and waging war on God and His Messenger (SAWS). 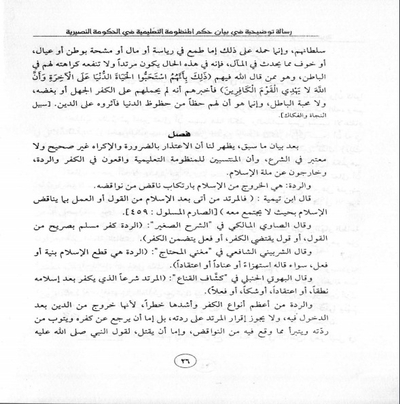 "The Fifth: And it is the great, most comprehensive and open of them in resistance to the law, and stubborn opposition to its rulings, acting in adversity against God Almighty and His Messenger (SAWS), and opposing the Shari'i courts, in preparation, extension, observation, rooting, derivation, formation, diversification, ruling and compulsion...for these courts in many of the gates of Islam are fully prepared, with gates opened, and people flock to them as swarms upon swarms, with their judges ruling between them by what contravenes the ruling of the Sunna and the Book- that is, from the rulings of that constitution- and it makes them embrace it and establishes them upon it, and makes them settle on it, so what disbelief is above this disbelief, and what nullification of the shahada that Muhammad is the Messenger of God is there after this nullification?" (Al-Durar al-Sanniya: part 16, p. 216). 5. Respecting the rights of man: the disbelievers have choked and have been annoyed by what the religion of Islam has stipulated in dealing with people on the basis of religion and creed. And they have hated what the law has brought in the section on hudud punishments and penalties, and they have condemned what it has designed in the rights and values between male and female. So they have established a concept they have called human rights, in order to defame the rulings of the religion, turn away the people from the doctrine of al-wala' and al-bara', and make the Muslims despise the Shari'i rulings.
. Dealing with people on the basis of humanity and human matter, far removed from the religious and doctrinal basis.
. Condemning the Shari'i hudud: like qisas, cutting, stoning and flogging, holding that they contravene the understanding of humanity.
. Condemning the distinction between man and women in stipulated rights in law, like divorce, inheritance and blood money, holding that they are equal in humanity. And each one of these three preceding tenets is disbelief, because they deem the Qur'an to be false and condemn its rulings, and the Ummah has agreed that whoever condemns or deems something from the Qur'an to be false is a disbeliever. The Imam Ishaq bin Rahwayh (may God have mercy on him) said: "The Muslims have agreed that whoever blasphemes the Messenger of God (SAWS) or rejects something that God- Almighty and Exalted is He- has revealed, or kills one of the Prophets of God- Almighty and Exalted is He: such a person is thus a disbeliever even if he is established in all that God has revealed" (al-Sarim al-Maslul 'ala Shatim al-Rasul: part 1, p. 9). 6. Rule of law over all: meaning that the source on which the state proceeds is the law, and no one has the right to go outside it or infringe on it, because it is the foundational source on which the disbelieving regime arises and refers to and is issued from. So the law is the legislator and is to be worshipped, obeyed and followed- and one must be subject to it and be led by its rule and refer to it in every matter. And this is among the greatest of what nullifies Tawheed and the shahada that Muhammad is the Messenger of God (SAWS). And after the statement of the ruling on the education system, and that it is based on disbelief, and its aim is to implant disbelief and call to it, it becomes clear to us that the ruling on those affiliated with this system of disbelief is that of disbelief and apostasy from the religion of God, because by their affiliation with this system of disbelief they have become a part of it, and members working in it, and they are the real implements in it, and without them it is not possible for this sector to function. 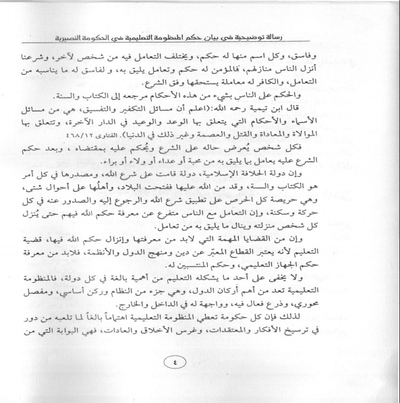 For those affiliated with the education system in the disbelieving Nusayri regime: they are not only among the supporters of disbelief and defenders of it and the Taghut- as is the state of the army- but also they are the ones who advocate for disbelief and implant the principles of disbelief and heresy in the lives of the people. And the Prophet (SAWS) warned about the likes of those people, and described them as "callers on the gates of Hell. Whoever responds to them, they throw them into it." And SAWS made clear that "they will be among our people, speaking our languages" (see Sahih al-Bukhari 9/51). So they are the implements of corruption of religion and morals, and axes of destruction in the Ummah, and spark of evil for the generations, and the harm they bring on the Ummah is among the strongest types of harm, because they are considered the essential level in society, nurturing the generations. So people hold them in high regard, and take their lead, and come behind them. 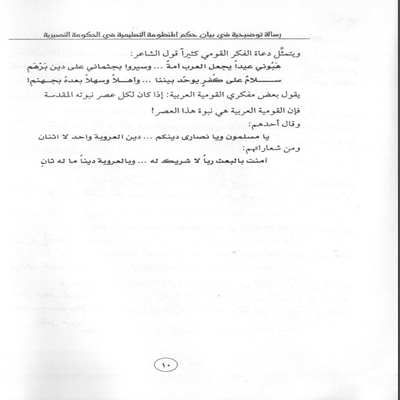 Therefore the Nusayri Taghut has exploited this organization to implant the support bases of its rule, for it has obligated them to come out in demonstrations supporting it, and has likewise obligated them to vote for it in elections, and has even made the schools and universities a base for elections and ballot boxes, and has made the educational system the supervisor of the outcome of the elections. 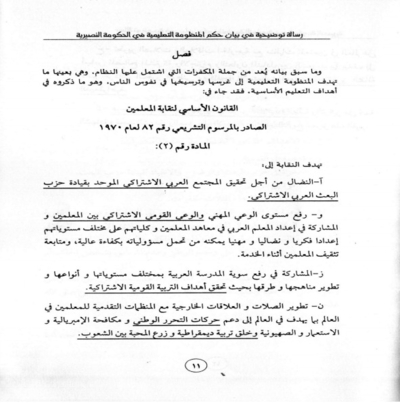 "It is not allowed for anyone to have special dealings in education or administrative and art works in the schools and private institutions for a period exceeding three months if that person does not join the membership of the syndicate according to the conditions that have come down in the internal system, and the aforementioned schools and institutions are considered responsible towards the ministry of education and the syndicate concerning the implementation of that and the consequences of the law will be applied on them as stipulated in the special law of education and its implementation list and the other laws and organizations regulating the private schools in the event of violation." And we have made clear what the teachers syndicate commission aims for, and what it strives to implant and embed in the lives of the generations, and there is no doubt that the teachers, directors and supervisors- male and female- are the ones who have been entrusted with the mission of realizing those aims and implanting and embedding those principles of disbelief.
. Necessity: and this is before affiliation, and they make that justification for them in becoming affiliated with the educational system.
. Compulsion: and that after joining, and they make it an excuse for them in affiliation to this organization. And it is necessary to clarify the ruling of committing disbelief in the case of necessity, and whether compulsion that they call true compulsion is in its conditions or not. As for necessity that they have made a justification for them in committing disbelief, they mean by that the necessity for them to have money that they receive in exchange for their work, for the same of providing a living for the family and the children. 1. The need for money does not allow for man to assail the gate of disbelief and penetrate into it for the sake of realizing material interest, for indeed it is well known that when the interest of religion and world conflict, the interest of religion is given priority even if the material world vanishes, and it is not allowed for man to commit disbelief for necessity, and the only exception is the one compelled. Ibn Taymiyya (may God have mercy on him) said: "Indeed from the things that prohibited, what is defined is that the law has not allowed from it anything for necessity or non-necessity like idolatry, abominations, speaking against God without knowledge, and mere wrongdoing, and they are the four mentioned in the Almighty's words- 'Say: indeed my Lord has forbidden abominations on the outside and inside as well as sin and wrongdoing without right and that you should associate with God that for which He has not sent down authority, and that you should speak against God what you do not know' [Qur'an 7:33]- so these things are forbidden in all laws and by their being prohibited God has sent all the Messengers and He did not permit from them anything at all and not in one of the circumstances, and for this it was revealed in this Meccan Sura"- (Collection of Fatwas: 13/470). 2. The causes of sustenance are provided by God's grace, and God's sustenance is wide, and it is not limited to this employment, so the man who takes a bundle of wood on his back can thus sells it and preserve his religion, better than selling his religion for the sake of honour from the material world. SAWS says: "Verily the spirit of sanctity has breathed in my heart. Indeed a life will not perish until its sustenance is fulfilled, so fear God and be proper in seeking, and having to wait a long time for sustenance should not make you seek it by rebelling against God, for God does not acknowledge what one has except by obedience to Him"- (brought out by Ibn Abi Shayba and al-Bihaqi in al-Sha'ab and it is authentic). See how SAWS has forbidden to his Ummah that waiting a long time for sustenance should lead them to seek it by rebelling against God, so how can there be exception for the one whose desire for wealth leads him to seek it by entering into disbelief? Thus the case of necessity by which those affiliated with the education sector excuse themselves is not be taken into consideration and is not justification for committing disbelief. There is no doubt that compulsion is one of the obstacles to takfir, because the one who is compelled is at a loss for choice and is compelled to say or do disbelief, but who is the compelled, and do teachers come under the ruling of the one who is compelled?! Ibn Hajer (may God have mercy on him) said: "Compulsion is forcing someone else to do what he does not want. 1. That the one behind it must be capable of projecting his threat, and the one commanded must be incapable of resisting, even if by fleeing. 2. That his thought should be overwhelmed that if he refuses that will come upon him. 3. His threat should be immediate. So if he were to say: "If you don't do such and such, I will hit you tomorrow"- the person is not considered to be compelled: and the exception is when he mentions a time very near or the practice happens in that he does not go back on it. 4. There should be no sign from the one commanded that shows choice on is part" (Fatah al-Bari part 12, p. 311). 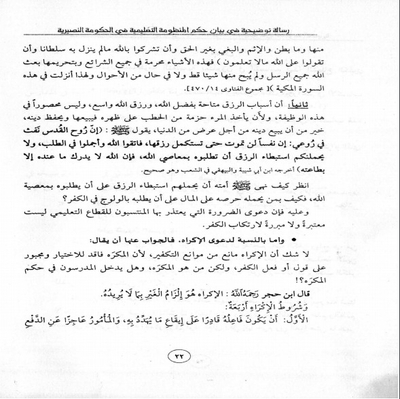 Consider the words of al-Hafiz ibn Hajer [medieval Shafi'i scholar] (may God have mercy on him), for he defined compulsion as forcing someone else to do what he does not want, and he mentioned among the conditions of compulsion that the person should not be capable of fleeing, and that nothing appears from him that shows it is his choice. So does entering into the education system and becoming affiliated with the syndicate commission constitute compulsion and being forced? Is one not able to abandon the work and escape from it? Or is it that the teacher fearing for his employment and salary hastens to affiliation, so that his worldly means of living may be handed to him, even at the expense of his religion? The Sheikh of Islam Muhammad bin Abd al-Wahhab (may God have mercy on him): "The words of the Almighty: 'Whoever disbelieves in God after his faith except the one who has been compelled while his heart is secure in faith, but those who have chosen disbelief in their heart, upon them is God's anger and a great torment for them. That is because they have desired the worldly life over the Hereafter, and God does not guide the disbelieving people" (al-Nahl 106-107) [Qur'an 16:106-7]. 1. His words: "Except the one who has been compelled"- so God Almighty has not exempted anyone except the one who is compelled, and it is well known that man cannot compel except on the basis of word or deed, and as for the creed of the heart, no one can compel upon it. 2. The Almighty's words: "That is because they have desired the life of this world over the Hereafter"- so He has made clear that this disbelief and torment have not been because of creed or ignorance or hatred of the religion or love of disbeliever, but rather its cause is that he partakes in the pleasures of the material world, so he has preferred that over the religion (Revealing Doubts). 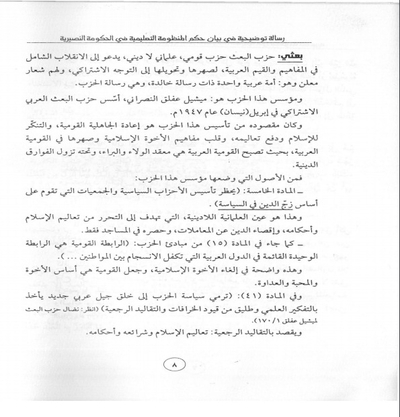 And Sheikh Suleiman bin Abdullah bin Muhammad bin Abd al-Wahhab [a descendant of Muhammad bin Abd al-Wahhab] said in his book- "Lines of evidence on the ruling of loyalty to the people of idolatry": "Know- may God have mercy on you- that when man shows agreement to the idolaters on their religion, out of fear of them and desire to flatter them and a desire to please them to repel their evil: he is a disbeliever like them even if he hates their religion and despises them, while loving Islam and Muslims. So only the one who is compelled is exempted from that, and he is the one over whom the idolaters gain authority so they say to him: "Disbelieve or do such and such, otherwise we will harm you and kill you". Or they take him and torture him until he agrees with them, so it is allowed for him to agree in tongue, as long as the heart is secure in faith. And the 'ulama have agreed that the one who speaks in disbelief out of banter is a disbeliever. So how can it apply to the one who shows disbelief out of fear or ambition in this world?! And many of the people of falsehood indeed abandon truth out of fear of the loss of their material world, and certainly, they thus know the truth and hold it to be true but have not been Muslims in that regard" (Lines of Evidence on the Ruling of Loyalty to the People of Idolatry). And he said (may God have mercy on him): the Almighty has said: "Whoever disbelieves in God after his faith except the one who has been compelled while his heart is secure in faith, but those who have chosen disbelief in their heart, upon them is God's anger and a great torment for them. That is because they have desired the worldly life over the Hereafter, and God does not guide the disbelieving people." So the ruling of the Almighty in ruling does not alter that the one who returns from his religion to disbelief is a disbeliever, whether he has an excuse- fear for life or wealth or family- or not; and whether disbelief is in his interior and exterior, or he shows it without his interior; and whether disbelief is in his deeds and words, or in one of the two without the other; and whether in ambition for things of the material world he obtains them from the idolaters or not. He is a disbeliever in every case, except the one who is compelled, and in our language it is: the one who is violated. Then the Almighty has conveyed that these apostates, choosing disbelief in their hearts, even if they vowed upon the truth and said "We have only done this out of fear"- upon them is anger from God, and they will have a great torment. Then the Almighty has conveyed that the reason for this disbelief and torment is not because of belief in idolatry or ignorance of Tawheed or hatred of religion or love of disbelief, but rather its cause: that he partakes in the pleasures of the material world so he has preferred that over the religion and the contentment of the Lord of the Worlds, for He has said: "That is because they have desired the life of this world over the Hereafter, and God does not guide the disbelieving people." So the Almighty has pronounced them to be disbelievers, and has conveyed that He will not guide them even as they excuse themselves by love of this world. Then the Almighty has conveyed that these apostates for the sake of desiring this world over the Hereafter are the ones on whose hearts, hearing and sight God has imprinted a seal. And indeed they are the neglectful ones. Then He has assuredly conveyed that they are the losers in the Hereafter" (Lines of Evidence on the Ruling on Loyalty to the People of Idolatry). 1. That he does that because he is under their authority with their strike and binding of him, and threatening him with killing, so they say to him: "Either you agree with us and show submission to us, and if not we will kill you." So in this case it is allowed for him to agree with them outwardly while his heart is secure in faith, as happened to Ammar when God Almighty revealed: "Except the one who has been compelled and his heart is secure in faith." And as the Almighty has said: "Unless you take precaution against them in prudence" [Qur'an 3:28]. So the two verses have shown the ruling just as Ibn Kathir notified regarding that in the tafsir of the verse of the Family of Imran. 2. That he agrees with them outwardly while disagreeing with them inwardly, and he is not under their authority, but rather he has been led to that whether for ambition for leadership or wealth or extreme attachment to a homeland or dependants, or fear of what will happen in the outcome. This person in this case will be an apostate and his hatred of them inwardly will not benefit him, and he is of those about whom God has said: "That is because they have desired the life of this world over the Hereafter and God does not guide the disbelieving people." So He has informed them that He has not held them to account over disbelief because of ignorance or hatred of Him, and not because of love of falsehood, but rather it is that they partake in the pleasures in the material world so they have preferred that over the religion" (The Path of Salvation and Deliverance). After affirming the preceding, it appears to us that excusing oneself by necessity and compulsion are not correct and not to be considered in the law, and that those affiliated with the educational system fall under disbelief and apostasy, going outside the path of Islam. And apostasy: it is leaving Islam by committing one of the nullifiers of it. Ibn Taymiyya said: "So the apostate is the one who after accepting Islam from word or deed commits that which nullifies the Islam as it does not concord with it" (al-Sarim al-Maslul 459). And al-Sawi the Maliki [late 18th-early 19th century CE Maliki jurist] said in "al-Sharh al-Saghir": "Apostasy is a Muslim's disbelief through what is openly said, or words that necessitate disbelief, or a deed including disbelief." And al-Sharbini the Shafi'i [Shafi'i jurist who lived in the 16th century CE] in "Mughni al-Muhtaj": "Apostasy is cutting off Islam in intention or deed, whether one says it in ridicule, stubbornness or doctrinal belief." And al-Buhuti the Hanbali [Hanbali jurist who lived in the 17th century CE] said in "Kashshaf al-Qina'": "The apostate in law is the one who disbelieves after his acceptance of Islam in pronouncement or doctrinal belief or doubt or deed." And apostasy is one of the greatest types of disbelief and the strongest in danger, because it is going outside of the religion after entering into it. And it is not allowed for the apostate to be established on his apostasy, but rather he must either return from his disbelief, repent from his apostasy and disavow what he fell into from the nullifiers, or he must be killed, according to the words of the Prophet (SAWS): "Whoever changes his religion, kill him" (narrated by Bukhari). And those affiliated with educational system are not excused by their ignorance of what they have fallen into from disbelief and apostasy, for the disbelief of the regime is clearer than the sun in the expanse of the sky, and the teachers are the ones most knowledgeable of the people regarding what is in this system from disbelief and heresy. Then if we accept the existence of ignorance, that is the result of their neglect and their turning away from learning about the religion, and their pouncing on the material world. And the religion of God is clear and the means of knowledge and education are provided with ease by God's grace, and it is not possible for the law to include those who are negligent between negligence and excuse, but rather whosoever has turned away from his religion and shown disdain for its ruling and laws, and exploited his time, capacity and efforts in realizing this ephemeral world, and has entered into disbelief out of ambition for ephemeral commodities, and has not religion from his efforts and time to learn its principles and nullifiers: such a person is not excused by consensus. Al-Qarafi [medieval Maliki jurist] said: "All ignorance that the one responsible can repel will not be a pretext for the ignorant one" (al-Furuq: 4/264). And Ibn al-Laham [Hanbali jurist of the 14th century CE] says: "The one ignorant of the ruling is excused only when he does not fall short or show negligence in learning the ruling, but if he falls short or shows negligence, he is absolutely not excused" (al-Qawa'id wa al-Fawa'id al-Usuliya"- p. 58). And the Sheikh of Islam Ibn Taymiyya (may God have mercy on him) said: "God's proof in His Messengers has undertaken to realize knowledge, so that those called should know of it is not among the conditions of the proof of God. Therefore the turning away of the disbelievers from listening to the Qur'an and contemplating it has not been an obstacle for God's proof to come upon them, and likewise their turning away from what has been transmitted from the prophets and reading the remains left about them does not prevent the proof if the capability exists" (al-Radd ala al-Munattaqin 1/99). 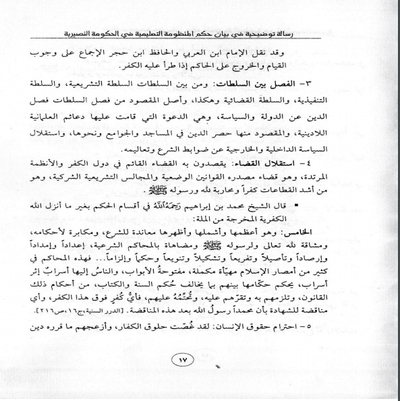 According to the preceding on the ruling of the educational system affiliated with the disbelieving Nusayri regime, and the ruling on those affiliated with it, it is necessary to put a complete stop to education, in protection of the honour of Tawheed, and cutting off the root of disbelief, its means and arms, and protecting the Muslims and preserving their religion. And as the ruling of the law has given clarification on those affiliated with the educational system, we call on all affiliated with this system to return to their religion, and repent to God for what they have fallen into, and disavow disbelief and its people, and open a new shining page with their Lord, and to be the implements of development and reform in their Muslim society. The Almighty has said: "And return to your Lord and submit to Him, before the torment comes upon you: then you will have no help. And follow the best of what has come down to you from your Lord before the torment comes upon you by surprise and you do not realize, lest a soul should say: 'Oh how great is my loss over what I neglected with regards to God and I was among the mockers.' Or it should say: 'Would that God had guided me, I would have been among the pious.' Or it should say as it sees the torment: 'If only I had a turn, I might be among the doers of good.' But yes, My verses came to you but you did not believe in them, became arrogant and were among the disbelievers. On the Day of Judgement you will see those who lied against God: their faces will be blackened. Is there not a residence in Hell for the arrogant? While God will save those who feared by their attainment. Evil will not come upon them, and they will not be sad" (al-Zumar 54-61) [Qur'an 39:54-61].